Last week, Founding Director of the NYC Veterans Alliance and veteran member Kristen Rouse and I reached out to Mayor de Blasio inviting him and First Lady Chirlane McCray to speak at a town hall with NYC veterans in advance of this year’s Veterans Day. 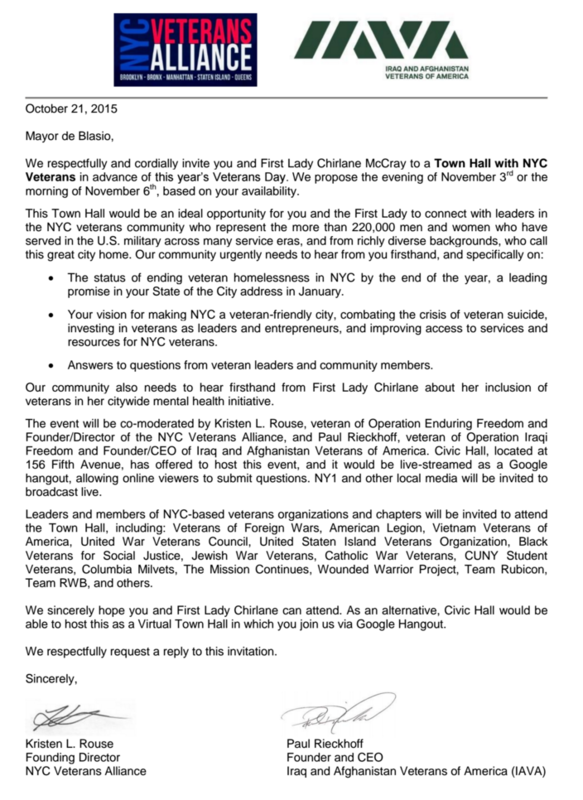 As the letter (below) mentions, the town hall would be an ideal opportunity for the mayor and First Lady to connect with leaders in the NYC veterans community who represent the more than 220,000 men and women who have served in the U.S. military across many eras, and from richly diverse backgrounds, who call this great city home. Answers to questions from veteran leaders and community members. Take a look at our invitation below. 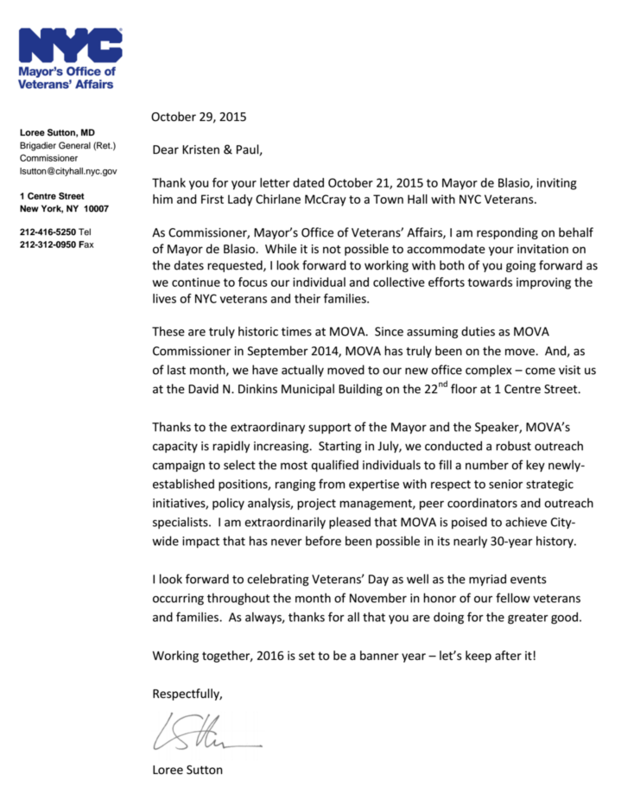 In response, Commissioner of the Mayor’s Office of Veterans’ Affairs General Loree Sutton sent a letter behalf of Mayor de Blasio stating he and Fist Lady Chirlane will not be able to accommodate with the dates requested. Read her letter of response below. IAVA is extremely disappointed in the response. It’s revealing that the mayor can’t even be bothered to politely decline the invitation himself, and shows how low veterans continue to rank on his priority list. Also, just days before Veterans Day, there seems to be no interest whatsoever from the mayor or his office in working with us on an alternative time and date for an event that works. 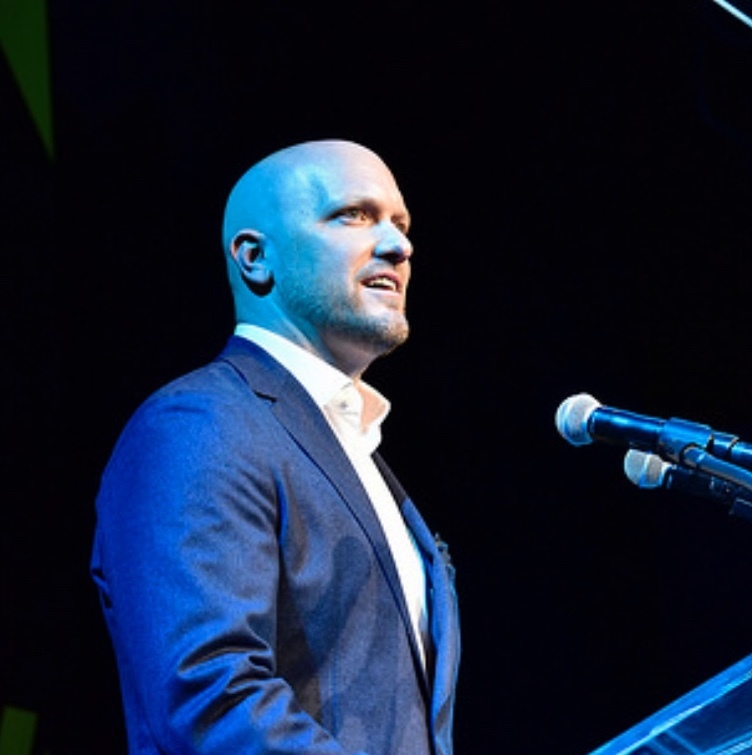 IAVA has extended an olive branch on behalf of our veterans community, and that olive branch has been ignored. This is why the mayor has a five percent approval rating among NYC IAVA members. Despite this dismissal, ignoring calls from IAVA to meet for months and the continued opposition to the critical Department of Veterans Services bill presented by IAVA and Councilman Ulrich, we will continue to try to work with this mayor. While we work around him. Politicians all over need to take note that they need to stand behind our veterans. Our community will not be ignored! And the entire city is listening.